Globalization has brought dramatic changes to demographics and labor markets. The workforce, suppliers, and customer base have become increasingly diverse and multi-cultural. While we have long recognized the importance of diversity and inclusion, we know that in today’s world building a diverse and inclusive workforce is both a business imperative and a key long-term success factor. We also know that diversity and inclusion (D&I) improves employee engagement and company performance as well as drives innovation and growth. Our workforce must reflect the diversity of our patients, consumers and customers around the world. We work hard to nurture a sense of belonging, where open hearts and minds can combine to unleash the potential of the brilliant mix of people at Johnson & Johnson. Bringing together and combining the unique perspectives of our talented people—including all their backgrounds, beliefs and experiences—is critical to our success in continuing to reinvent ourselves. 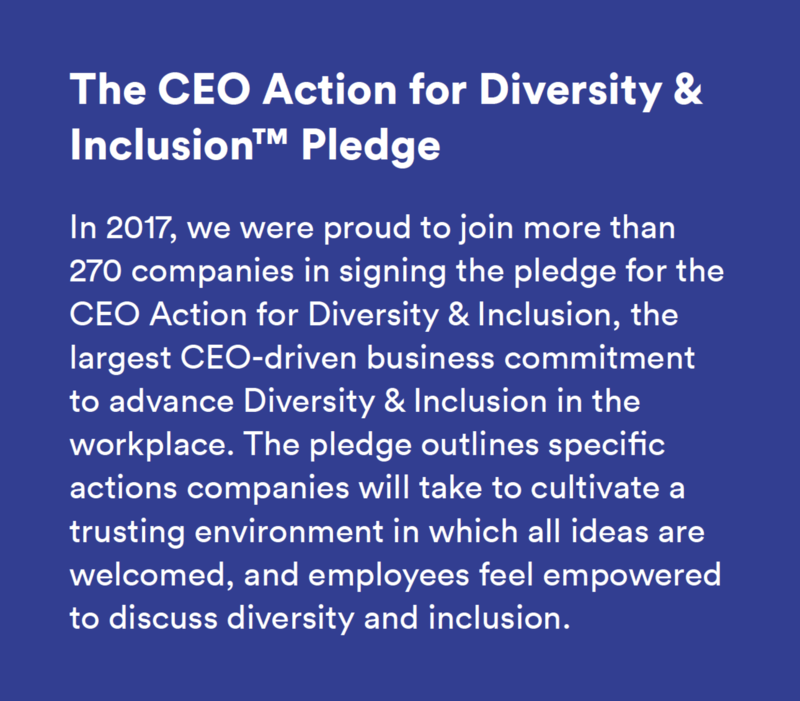 We promote diversity at every level of the organization, and this commitment starts at the top with our Chairman & CEO, who consistently stresses the importance of D&I in his communications to employees. 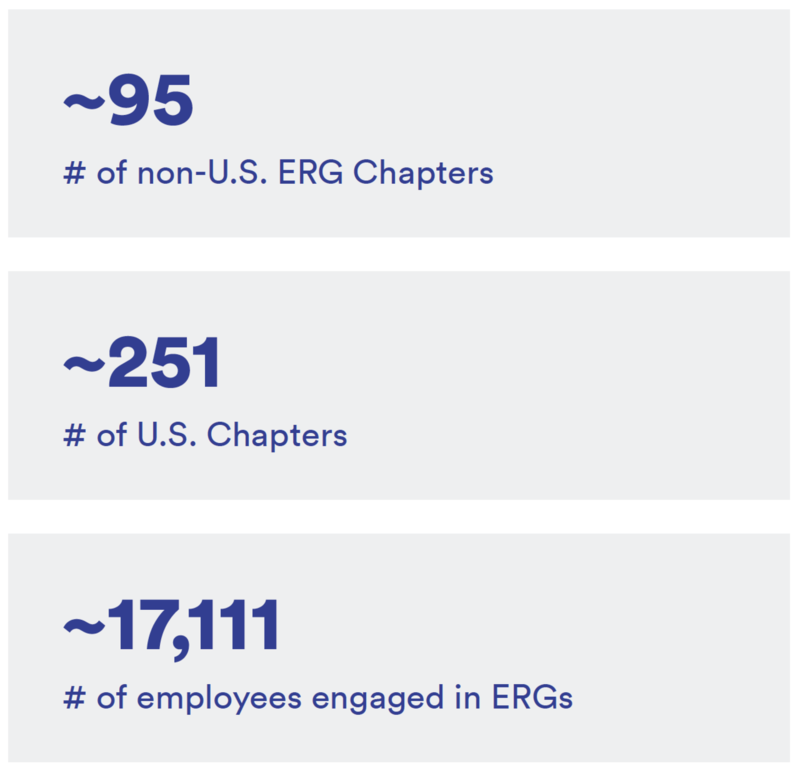 Members of our Executive Committee serve as executive sponsors of our Employee Resource Groups (ERGs), and all leaders within the Company have D&I as part of their business goals and leadership commitments. Led by our Chief Global Diversity Officer, the Global Office of D&I is comprised of four strategic teams focused on advancing global inclusion and diversity, embedding D&I in the business, developing strategic partnerships and measuring our impact through accountability models. Our Chief Diversity & Inclusion Officer has a dual reporting structure to our Chairman & CEO and to the Executive Vice President, Chief Human Resources Officer, who is a Corporate Officer and a member of the Johnson & Johnson Executive Committee. Our enterprise-wide D&I has three pillars: advance our culture of inclusion and innovation; build a diverse workforce for the future; and enhance business performance and reputation. We believe focusing on these strategic areas, which are integrated into key talent management processes, will help our Company attract and retain top talent; better understand the needs of our increasingly diverse patients, consumers and customers; and drive health innovations to improve outcomes for all. A primary focus for D&I has been in driving awareness of unconscious bias and fostering a culture of inclusion in the workplace. Engaging with Professor Mahzarin Banaji of Harvard University, in 2017 we provided an “Unconscious Bias” training program to all our people leaders. This curriculum was reinforced with e-learning modules and group discussions, which are extending into 2018. The content focuses on helping our employees understand how bias can impact our thinking and how to mitigate it in our day-to-day work. 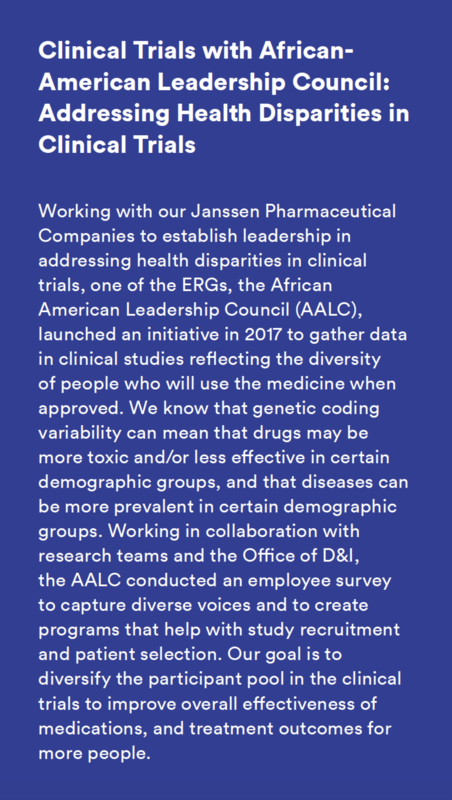 By mitigating unconscious bias, we will be better able to tap into our diverse backgrounds and unique experiences to fuel how our Company adapts and innovates to advance the trajectory of health for all. We are embedding these concepts into every aspect of our talent management approach. We believe in recruiting the best and brightest diverse talent around the world. As the customers, patients and doctors we serve become ever more diverse, ensuring that we reflect these voices and perspectives in our employee population is critical. We therefore analyze and evolve our recruiting processes and procedures to continually improve how we identify, attract and recruit. In addition, we are raising awareness of unconscious bias and providing training and resources to mitigate this across our hiring practices. 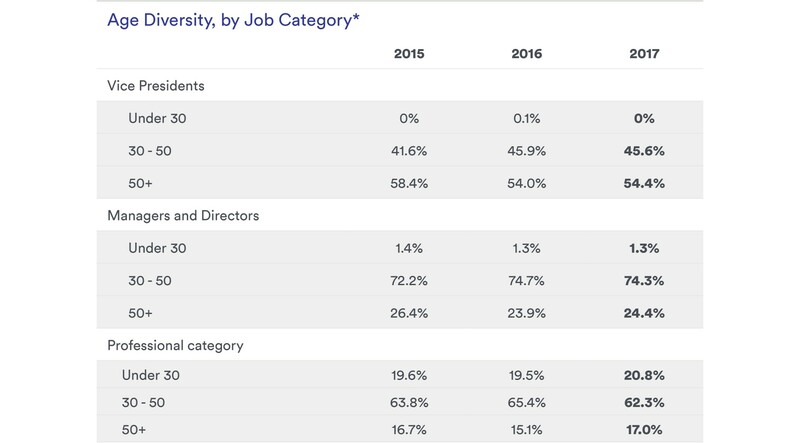 To help us increase the diversity of the candidate pool and remove bias, we are leveraging innovative technologies, such as artificial intelligence-powered solutions, like Textio, which we began using in 2017. Textio removes gender bias from our job descriptions. We are also using Google Job API to power the Johnson & Johnson Careers site, an innovative tool that is helping us improve our hiring process by matching the best possible applicants with relevant jobs using the power of data and machine learning. Navigating the nuances of job titles, descriptions, skills and preferences, the API tool is helping us facilitate more accurate match-ups of job seeker preferences with relevant job listings. Across the interviewing process, we educate interviewers about unconscious bias and ways to address it during the interview. This interviewer training also includes behavior-based interviewing techniques. We strongly encourage having interview teams that are diverse (to include a mix of individuals with diversity of thought and experience, and those who reflect ethnic/racial and gender diversity). We also encourage the identification of diverse slates for all positions. To connect us with top diverse candidates, we partner with external organizations and are expanding and deepening existing relationships with key universities. In addition, we are activating and training our Employee Resource Group members to be talent scouts to increase diverse referrals. We focus on strengthening the capabilities of our managers in inclusive leadership – especially concepts around managing unconscious bias. 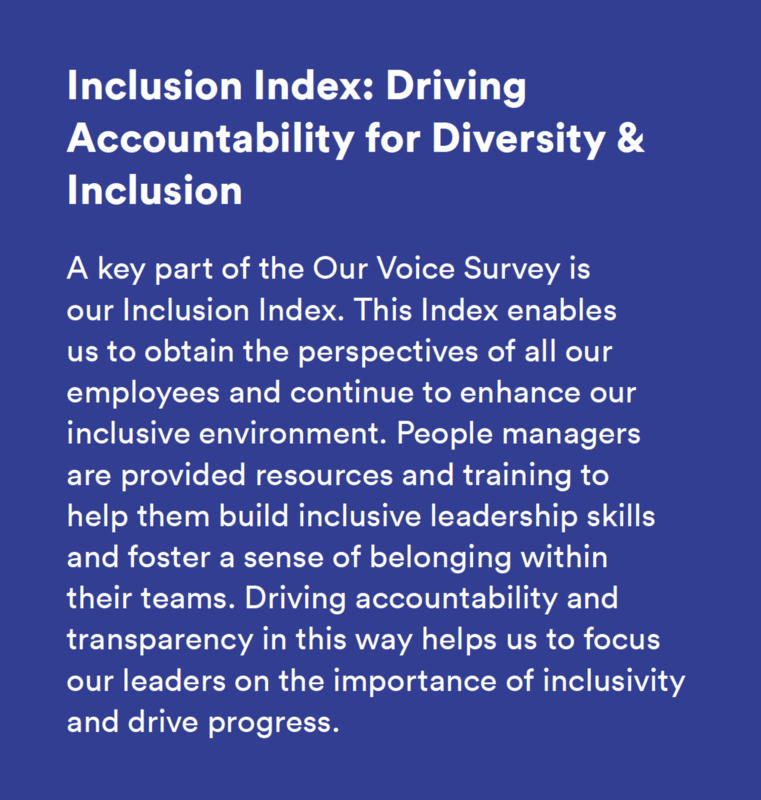 We know that this will have beneficial effects on enhancing our culture of inclusion, and will enable employees to be themselves, perform their best, and be recognized. We are ensuring that we have fair representation of diverse populations in training and development courses. Throughout 2017, we evaluated the selection process for our courses to ensure that they are as inclusive as possible. In addition, we took steps to further integrate development courses into the portfolio of training targeted at employees with upward potential. Research has shown us that diverse talent may need additional support in building relationship capital. We’ve found that sponsorship is an important tool to acquire this capital. Based on these insights, in 2017 we launched a sponsorship program focused on diverse talent. The initial program has our Executive Committee serving as sponsors to emerging diverse leaders, with each member having at least one sponsee. The program will be expanded in 2018 into more parts of the organization. 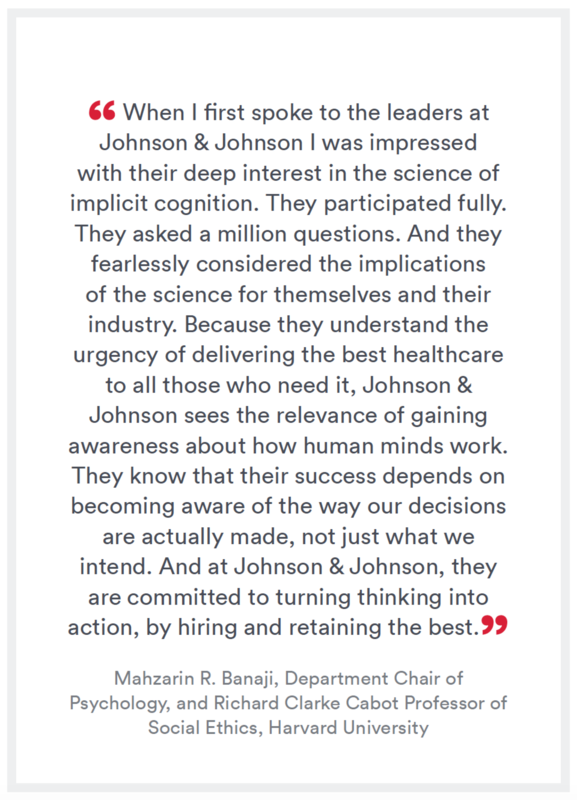 We know that having diverse leaders is a critical component that will enable Johnson & Johnson to continue providing health solutions today and into the future. Through on-line trainings (e-learning), reminders, and just-in-time notifications, we enable our leaders to better identify and promote the wide range of talents needed for our businesses. We are developing ways in which we can further codify mitigating unconscious bias concepts and learnings into important points of the performance evaluation and succession planning processes. Impacting the communities in which we live and work. Through these focus areas, ERGs help us attract, recruit, onboard and develop new talent. They also provide rich insights on our diverse patient and customer base as well as support for enterprise community initiatives. The internal initiatives they drive help to improve our workplace culture by enhancing a sense of belonging; and their community-focused efforts leverage our size and expertise to bring about positive change in the community. To advance health for all, our Company believes that we need to connect people from diverse backgrounds to solve – for the broad range of health and wellness – issues that people around the world face. Johnson & Johnson strives to work with suppliers as diverse as the world in which we live, and to unite around a common purpose so we can pave the way to a healthier future for those we serve. The foundation of our supplier diversity approach is our Global Supplier Diversity and Inclusion (GSDI) program, which has been making an impact in connecting diverse businesses with growth opportunities that positively impact everyone involved for more than 20 years. More information on GSDI can be found under Supplier Diversity in the Responsible Business Practices section of this report. * All percentages are based on employee headcount data from Human Resources Information Systems (HRIS). HRIS headcount methodology differs from that used for the headcount in the Annual Report/Form 10-K. HRIS data exclude employees on long-term disability, fixed-term employees, interns/co-ops/students, and newly acquired Abbott Medical Optics employees.